The screen shot above depicts a service record example for NameCheap. Most of the fields in this dialog are self explanatory, but some fields require brief explanations. DDNS Password: The Dynamic DNS password is comprised of random alpha-numeric characters. It was assigned to you by NameCheap when you registered at the site. Follow these steps to locate it. Login at NameCheap.com using your credentials. Select "Account" -> "Domain List" menu item. Select "Advanced DNS" button on the top banner. Scroll down to the "Dynamic DNS" section. Your Dynamic DNS Password is listed in this section. 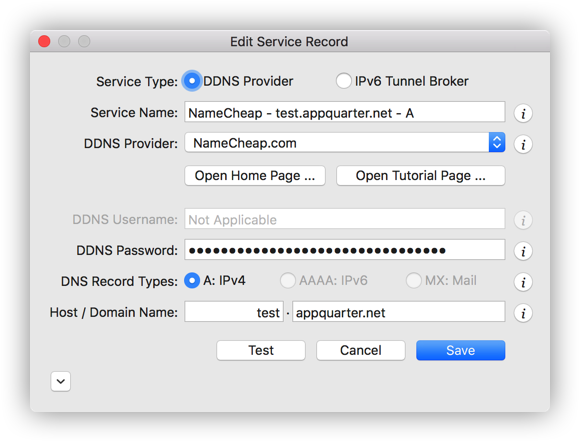 DNS Record Types: NameCheap supports dynamic DNS record of type A. Host / Domain Name: For a domain root, you can leave the Host field empty, or enter "@".